People cross the Las Vegas Strip where a lone gunman opened fire on the audience at the Route 91 Harvest country music festival Sunday night. The gunman, identified as Stephen Paddock, 64, of Mesquite, Nev., fired from a room on the 32nd floor of the Mandalay Bay Resort and Casino. When police entered 64-year-old Stephen Paddock's 32nd-floor hotel room at the Mandalay Bay in Las Vegas, Clark County Sheriff Joe Lombardo says, they found "in excess of 10 rifles." Paddock is suspected of firing down from his room at a crowd of more than 22,000 country music festival attendees. The shooting left at least 58 people dead and 515 injured. A SWAT team used an explosive to breach his room and then "found the suspect dead," says Lombardo. He also says their information suggests that Paddock had been in the hotel room since Thursday. The massacre has left some people questioning how the suspect was able to bring so many guns into the hotel. During a news conference on Monday, Lombardo said that Paddock brought the weapons into the hotel on his own and that he used "a device similar to a hammer" to smash the windows. Randy Sutton, who spent 24 years with the Las Vegas Metropolitan Police Department, told CBS This Morning that Paddock had plenty of time to get the guns to his room. These are the same kinds of questions people raised after the explosion at the Ariana Grande concert in May, the Pulse nightclub shooting in June 2016, the San Bernardino mass shooting in December 2015 and so on: why wasn't security tighter? What more can be done? How did this happen? Robert Gardner, an independent security consultant with an office in Las Vegas, said there would have been no reason for hotel security to identify Paddock as a threat. "It looks to me like this guy just checked in as a guest, and it's very common for guests to have a lot of luggage. It's relatively simple to conceal weapons in luggage. Actually, security wouldn't be involved, because it looks like he went to a room. Typically he wouldn't deal with security; security wouldn't be aware of his presence." Gardner says there's no way security could have known about the threat. 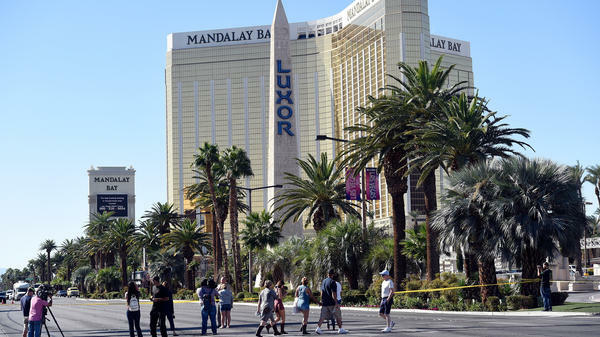 "Most of the hotels [in Las Vegas] have a fairly large and pretty professional security department," he said. "If I understand what I'm reading about what happened, there's nothing that security could have done to stop that." Security officials could be involved if someone openly carried a weapon into the casino, but there's no way for officials to know whether weapons are hidden in hotel luggage, Gardner said. "Most of the casinos, if not all of them, do not allow firearms in the casinos. If somebody were to come in with one, they would ask them to leave," Gardner said. "I can assure you, if somebody came in brandishing a weapon, he would get a reaction from security." Gardner said there is no reasonable way for hotels and casinos to search guests in an attempt to prevent similar shootings from happening. "How would you screen everybody coming in and search their luggage and all that? It would be a logistical nightmare No. 1. Could it be done? Sure it could be done, but the risk of this kind of thing happening is so rare that having that kind of security in place just wouldn't be a reasonable thing to do. If somebody is determined to commit a crime like this, they'll find a way to do it. It's almost impossible to prevent." Thomas Lekan, who owns his own security consulting firm in Brecksville, Ohio, said hotel security staffs across the country need to have better relationships with local law enforcement to prevent similar attacks in the future. Lekan previously helped run security for Stouffer Corp.'s 42 resort and hotel properties, including the Mayflower Hotel in Washington, D.C. While he was with the company, it employed more than 1,000 security personnel across the properties who worked closely with law enforcement. "The only way to make a difference is to have that cooperation, and have both parties feel comfortable saying 'I think we have a guy here with a loose screw, and you should check it out,' " he said. "The old 'see something, say something' works in all industries. We're good at doing that at the schools, and now we have to get good at doing that at hotels and concerts." Lombardo said hotel staff didn't report anything suspicious. Lekan said he thinks the deadly shooting will prompt more heightened event security, too. Event planners may consider staying away from outdoor areas with high-rise buildings nearby where potential shooters can perch. "Until this, nobody thought that could be possible, but when you think about the wars we've been in — where do snipers go? They go to the highest point and get the advantage of that height. I don't know if this guy thought about that, but he sure used it." Lekan said whenever he is hired to handle security, he thinks about the shooting at the Pulse nightclub in Orlando last year. Now, he'll also think of last night's ordeal. "Those two events really stand out for a security professional and make you really start thinking, 'What am I going to do to make sure this event is OK?' "
Isabel Dobrin is an intern for NPR's Digital News desk.